Color Shown: Ivy Green Another new model for 1966, the Town Landau replaced the Landau for this one year only. 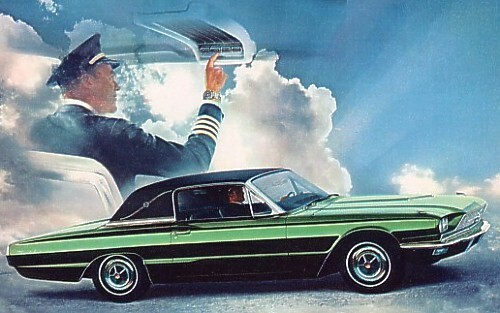 Note the difference between this model and the Town Hardtop: the Town Landau features a Levant grain vinyl roof in Black, White, Parchment, or Sage Gold with color-coordinated S-Bars.Inside, the Town Landau has the same standard equipment and features as the Town Hardtop, with the exception of the floor and roof consoles have a simulated woodgrain appearance, as does the steering wheel (without speed control), and both door panels have woodgrain inserts.The designation “Town” identifies only the rear quarter roof line; the designation “Town Landau” requires the additional trim (vinyl roof, S-Bars, woodgrain,etc.) that are unique to the Town Landau only.